Peru boasts the second-largest swath of Amazon rainforest in South America after Brazil. Unique, diverse and outstandingly rewarding, Peru’s best Amazon reserves are fiercely protected hubs of endemic fauna and flora, boasting some species which are not found in any other region of the Amazon. Sustainable tourism is an important priority in Peru and the government has gone to great lengths in ensuring the country’s Amazon reserves be fervently shielded from threats of deforestation. So although the Amazon region of Peru is, indeed, quite colossal, only parts of it are accessible to tourists. Luckily, however, these regions are certainly extensive enough to make multiple unique trips possible, and home to all the wildlife and incredible luscious nature you’d expect from the Amazon. Here are the top things to do in Peru’s best Amazon Reserves, as well as all you need to know to choose your ideal corner of jungle heaven. Manu Biosphere Reserve covers a mind-boggling portion of luscious rainforest that stretches for 1.7 million hectares, and is widely regarded as the best mecca for avid nature-lovers. Wildlife is free to roam in and out of the park’s boundaries and a smattering of amazing forest lodges offer you the change to come face to face with endemic Amazon creatures right outside your eco-lodge cabin door. Alongside the below-mentioned Pacaya-Samiria National Park, and Tambopata, Manu is one of the most fervently protected reserves in the world and access to most of it highly restricted. Manu is home to 200 species of mammals, over 1,000 different species of birds, thousands of butterflies and reptiles, and you’ll find over 250 different exotic trees in merely a single hectare. 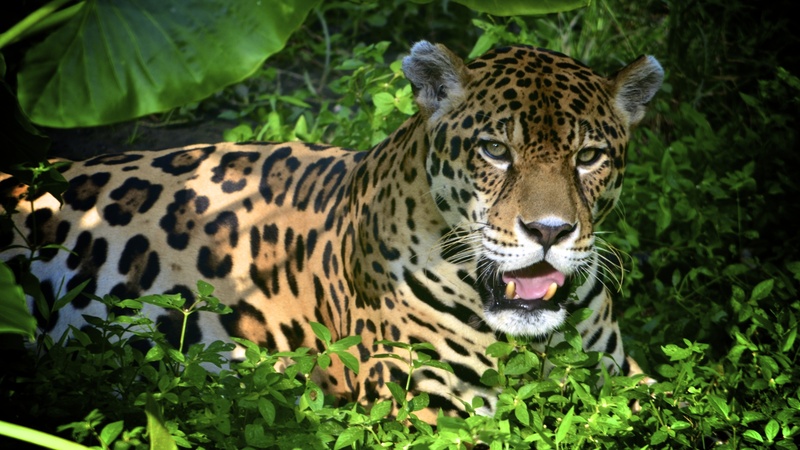 Jaguars, several species of monkeys and black caimans are just a few of the creatures who call Manu home. Where: Located in an isolated south-eastern region of Peru called Madre de Dios, Manu National Park is accessible via Cusco (which is just to the south) either by plane to Boca Manu or by bus to Atalaya. What: Over 25km of trails meander through the most accessible part of the rain and cloud forests, offering you copious chances to spot wildlife along the way, all the while learning all about the unique traits of this incredible national park. Manu jungle trips include outings on foot and by boat from you chosen lodge, and the park includes cloud forests along the sides of the mighty Andes Mountain Range, so the variety of ecosystems and wildlife is unparalleled. Why: Wildlife lovers love Manu because animals are easily spotted and incessantly abundant. Although located in an isolated region, Manu is easy to reach from Cusco, which makes an Amazon jungle experience here a convenient option for those on a longer tour of Peru, who don’t necessarily have time to visit another Amazon-blessed country. When: The most popular time to travel to Manu is during the drier months, between May and October, which coincides with high-tourist season in Peru, in general. It is very hot in the rainforest during this time, so your activities will usually be split up into early morning and afternoon outings, leaving you the hottest mid-day hours to relax and unwind in your lodge. Having said that, any time you visit Manu you will be overawed by the experience, even torrential downpours notwithstanding, so if you’re visiting Peru at any other time there’s certainly no need to discount a trip to Manu. Generally speaking, wildlife viewing is excellent at any time of year. 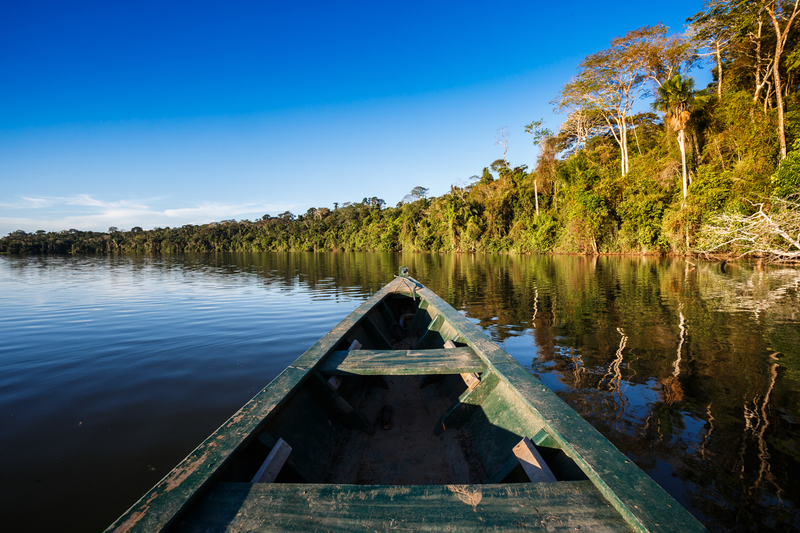 For an even more remote jungle experience, head to Pacaya-Samiria, a flooded section of the Peruvian Amazon which is only accessible by plane or boat. At 2 million hectares, this reserve supersedes Manu in sheer size and is the largest nature reserve in the whole country, as well as the largest single reserve in the Amazon. An ethereal landscape of flooded rainforests, Pacaya is not only a bird-lover’s paradise but offers a glimpse into the incredible biodiversity found in Peru. Where: In northern Peru, near the border with Ecuador, Colombia and Brazil, Pacaya-Samiria is accessible via flight to Iquitos, with daily flights offered from Lima. What: Being the flooded wonderland it is, Pacaya-Samiria is best explored on a multi-day cruise, which offers the chance for many on-land activities. Alternatively, you could base yourself on a shore-side lodge and take day-trips by boat and on foot from there. Why: The incredible flooded landscapes of Pacaya-Samiria, and its blissful remoteness and isolation, make this a superb destination for anyone wanting a more ‘middle of nowhere’ jungle experience. If you’re wanting to see more aquatic wildlife (including the beautiful pink dolphin as well as giant turtles) then this is the section of Amazon you’ll want to explore. Moreover, here is where you’ll find the most luxurious Amazon cruises of all, so if you’re craving a jungle escapade with a twist of deluxe comfort and exceptional culinary experiences, then you’ll want to look no further. When: Rain drenches this region of the Amazon between October and April, each year, which is when the rivers flood the plains even more. The most popular months occur outside of this period but do note that your wildlife viewing experience will be amazing no matter when you choose to visit. Yet again another immense biodiverse nature reserve, Tambopata offers perhaps the most diverse list of activities options of all the ‘jungle’ reserves in Peru. First established as a protected zone in 1990, this reserve boasts eight different types of forests (including tropical, subtropical and cloud) and is home to literally thousands of diverse species of wildlife, some that are not found anywhere else in the Amazon. 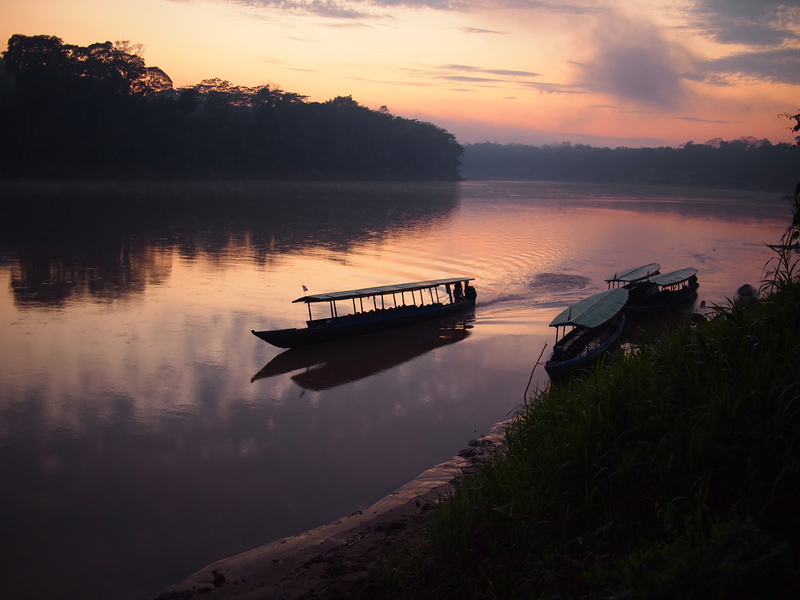 Tambopata is also home to indigenous tribes which still lead a subsistent life based on fishing and hunting, as well as the world’s largest clay licks. 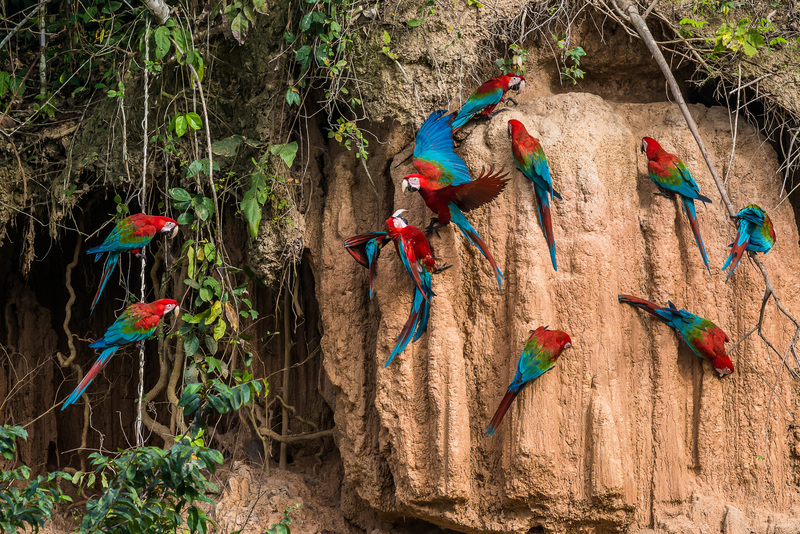 The colourful macaws in clay lick in the Peruvian Amazon jungle at Madre de Dios. photo credit: shutterstock. Where: Tambopata sits in south-eastern Peru, bordering Bolivia. Trips can be made from Puerto Maldonado, which is easily accessible via flight from Cusco. What: From mountain-biking to boat trips, hikes, canopy walks, kayaking and paddle boarding: Tambopata offers an intoxicating array of fantastic activities to get you out and immersed in its wonderful nature. Why: Considering Tambopata is relatively easy (and swift) to reach from Cusco, the park is favoured by those short on time. Even a 2-day Tambopata tour is incredibly rewarding. 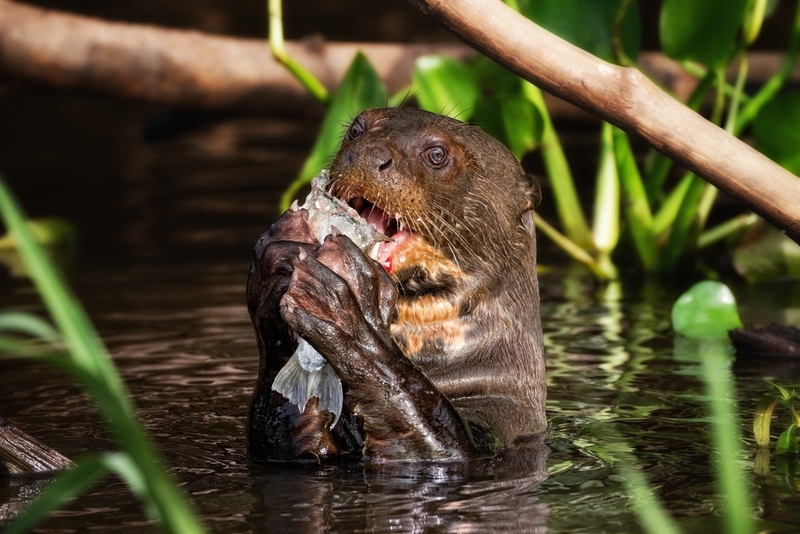 The park is also home to giant river otters, which are absolutely awe-inspiring to see and the largest macaw and parrot clay licks in the whole country, attracting hundreds of colourful birds. 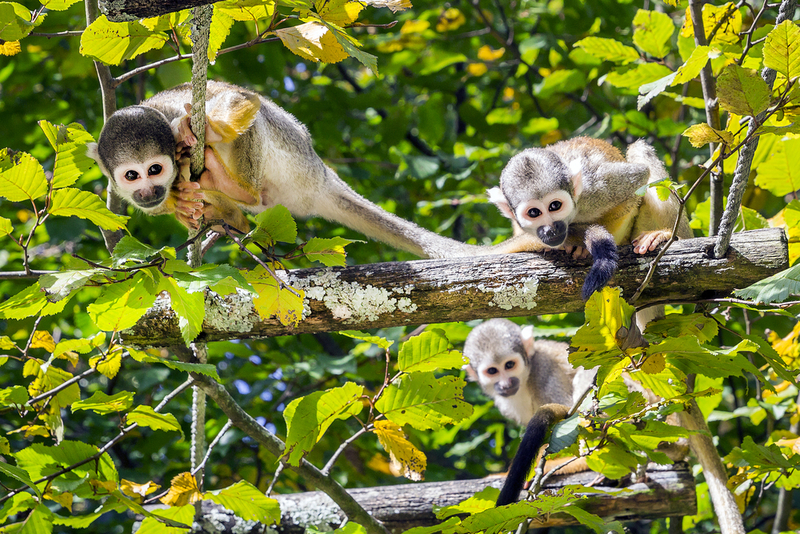 This is also the best spot to admire the greatest variety of monkeys in the shortest time possible, as huge troops head down to the shores of Lake Sandoval to feast on delectable fruits. When: Being the luscious reserve it is, Tambopata receives plenty of rain all year long, although the rainiest months are from December to February and the driest (sort of) from May until October. A trip to Tambopata is brilliant at any time, naturally, although the list of activities on offer does change depending on water levels and state of terrain. Mountain-biking in a metre of flooded mud is perhaps not so pleasant! Considering the varying climatic zones, you may be surprised to learn that temperatures in Tambopata, between June and August, can drop to the mid-teens, although being the driest they tend to be the most popular months for visitors. If admiring swarms of activity on clay licks is of particular interest to you then do note that the quietest months are April to June whilst the busiest between September and January, when parrots enter breeding season and alter their diet. Smaller protected Amazon reserves, some next door to the above-mentioned ‘big names’, also offer chances for especially unique and off-the-beaten-track experiences. So if you’re up for an unforgettable Amazon experience in Peru, simply contact us and we’d be thrilled to organise a bespoke tour to one of Peru’s very best Amazon Reserves.